PDFs are wonderful things. 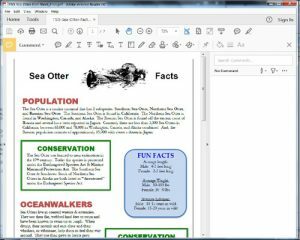 Short for “portable document formats,” they present a fixed format that displays the same way on all computers, regardless of operating system or screen size. As a result, it’s incredibly useful for sending documents that need to look the same for both the sender and the recipient, things like textbooks, business brochures, and designed print layouts. 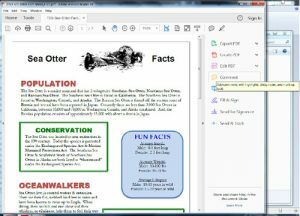 But for all their utility, PDFs can be scary for an editor. 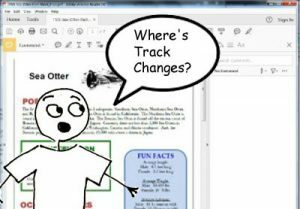 After all, you can’t just turn on Track Changes as in Word and go to town. The entire point of a PDF is that it always looks the same. So how do you make changes or suggestions? 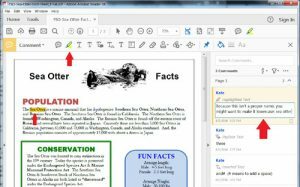 Thankfully, there is a great set of tools already built in to the most popular PDF reader, Adobe’s Acrobat Reader DC. Better yet, it’s free! That’s right; you don’t need to shell out for an expensive new program to edit PDFs. 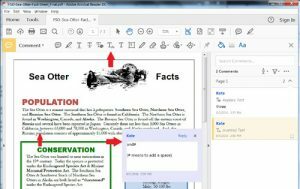 You just need to fire up good ole Acrobat Reader DC and get comfortable with the editing tools. Now you’re ready to rock! There are three major tools that you’ll find yourself using frequently: Text Edit, Highlight, and Sticky Notes. 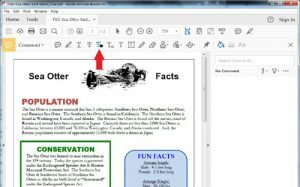 Click and hold down your left mouse button anywhere on the document you like and drag your cursor to highlight the text you want to replace. A box will pop up when you let go of the left mouse button, giving you a place to put your rewrites. Need to insert missing text? Click the T with a small carat (^) under it, and then click anywhere in the document you like to insert text. You’ll get that same comment box popping up and can simply type your insertion in. Cool, huh? As a note, sometimes it’s hard to indicate that a space should be added in PDF texts. To do this, use an old proofreader’s mark, the hashtag, which # means “add a space.” If you use this shorthand, be sure to explain it clearly to the customer in a note. What if you want to suggest a change for a specific sentence or phrase? In Word, you’d simply highlight the text in question, and then use a Comment Box. In Acrobat Reader, it’s different but just as simple. Click the Highlight tool in the toolbar, and then highlight the text you want to remark on. If you double-click the yellow highlight that appears, a comment box will pop up or appear in the comment bar on the right side of the screen, and you can type in your comment. Sticky Notes are another way of commenting on a PDF, but they’re best used for overall comments on design, layout, or the structure and function of the document. Using too many Sticky Notes can look cluttered and can be hard for the customer to follow. To add a Sticky Note, just click on the toolbar button that looks like a cartoon word balloon. Click anywhere you like in the document, and a little yellow box with a word balloon icon in it will appear. Double-click that, and you’ll get a popup box where you can write your comment. That’s all there is to it! 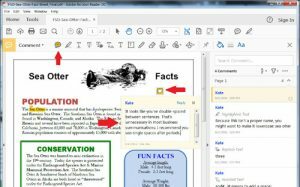 You can play with other tools in that Comment toolbar up top, but these three are really all you need to be able to edit PDF documents easily and with professional results.